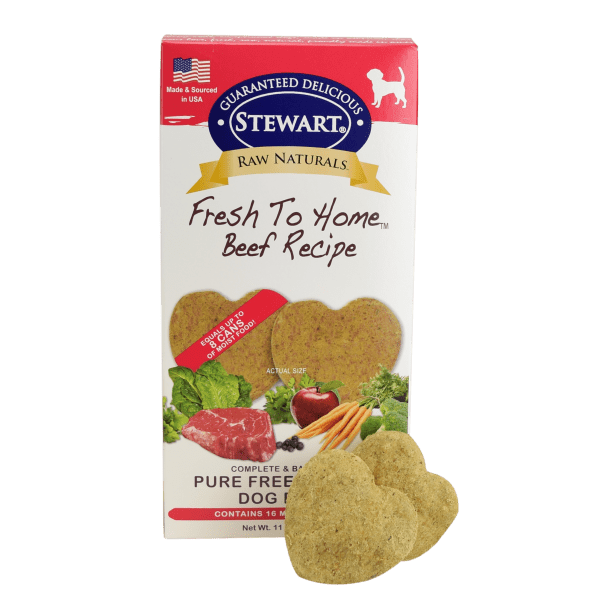 Beef is the single protein in these patties; perfect for picky dogs or those with sensitivities or allergies. 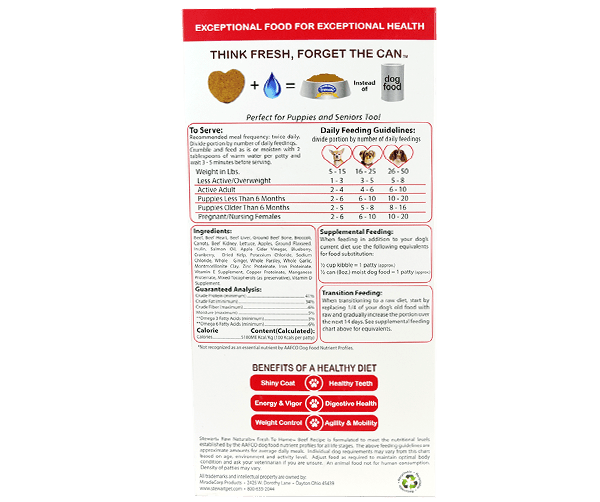 The added fruits, vegetables, vitamins and supplements provide everything your dog needs. We leave out the fillers, like soy, potato and gluten. You won’t find anything artificial here. 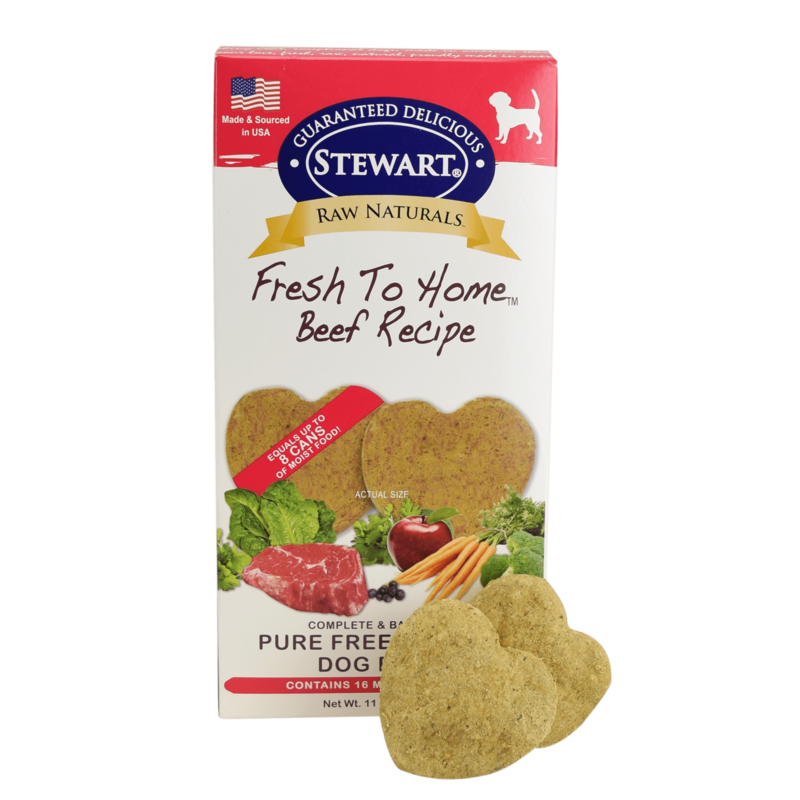 All Stewart Raw Naturals freeze dried beef dog food patties are made in the USA with the freshest ingredients. 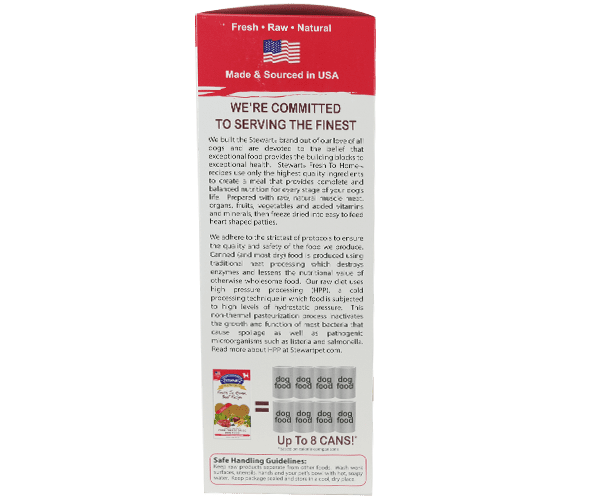 For over 45 years, we’ve been building on our heritage of trust with innovations like freeze dried dog food. 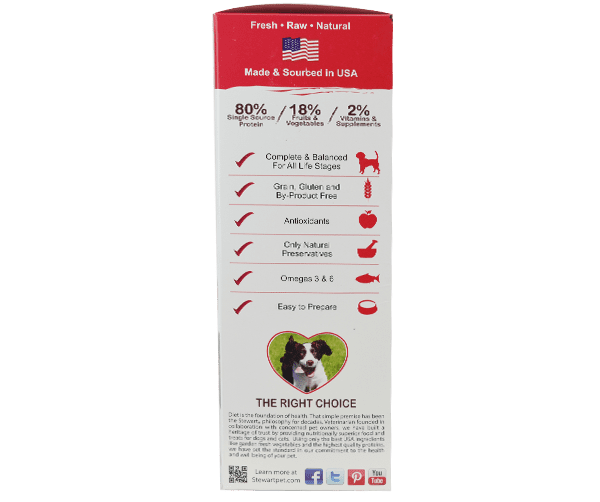 Now you can give your dog all the benefits of Raw Naturals in a patty. Dogs love these freeze-dried beef dog food patties and you’ll appreciate the portion control of a can without the mess. Use the small, medium or large patty alone, as a topper or a delicious layer in the bowl. It’s the easiest way to unleash nutrition and joy! 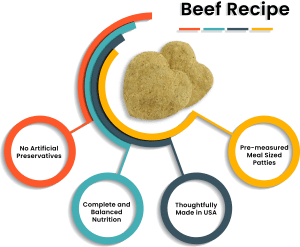 Beef, Beef Heart, Beef Liver, Ground Beef Bone, Broccoli, Carrots, Beef Kidney, Lettuce, Apples, Ground Flaxseed, Inulin, Salmon Oil, Apple Cider Vinegar, Blueberry, Cranberry, Dried Kelp, Potassium Chloride, Sodium Chloride, Whole Ginger, Whole Parsley, Whole Garlic, Montmorillonite Clay, Zinc Proteinate, Iron Proteinate, Vitamin E Supplement, Copper Proteinate, Manganese Proteinate, Mixed Tocopherols (as preservative), Vitamin D Supplement. Divide portion by number of daily feedings. Crumble and feed as is or moisten with 1 tablespoon of warm water per patty and wait 3 – 5 minutes before serving.